Silicon Valley’s population has skyrocketed in the last several decades and, to keep up, development is booming. Some residents are worried this will put a strain on water resources, which are especially tight during California’s drought. But experts say that smart development can also be water wise. MOUNTAIN VIEW, California – The 12-acre (4.85-hectare) lot at the intersection of Delaware Drive and Concar Street in San Mateo has been reduced to dirt, with the rubble of its previous incarnation (a Kmart) hauled away. Behind the chain link fence cloaked in green cloth are cement mixers and bulldozers preparing for what comes next. Near the confluence of Highways 92 and 101, and next door to the Hayward Park Caltrain station, this is prime real estate in coveted Silicon Valley where development is trying to keep pace with expanding tech companies and increasing population. Soon this will be Station Park Green, a mixed-use development with 599 residential units, 10,000 square feet (930 square meters) of office space and 60,000 square feet of retail space. It’s just one of many developments planned throughout the region. 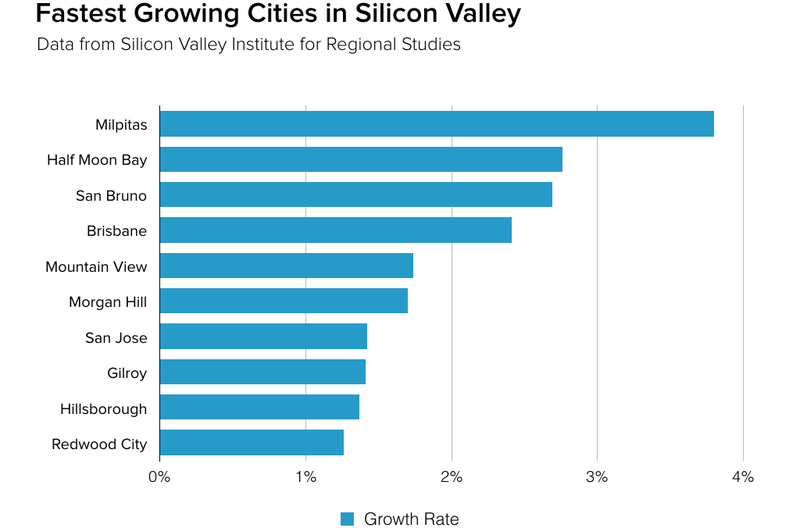 In many places, Silicon Valley is bursting at the seams, with growth rates between two and four times higher than the state as a whole in the last two years. The fastest-growing cities are Milpitas, Half Moon Bay, San Bruno and Brisbane. In May 2015, Silicon Valley’s population hit 3 million for the first time. 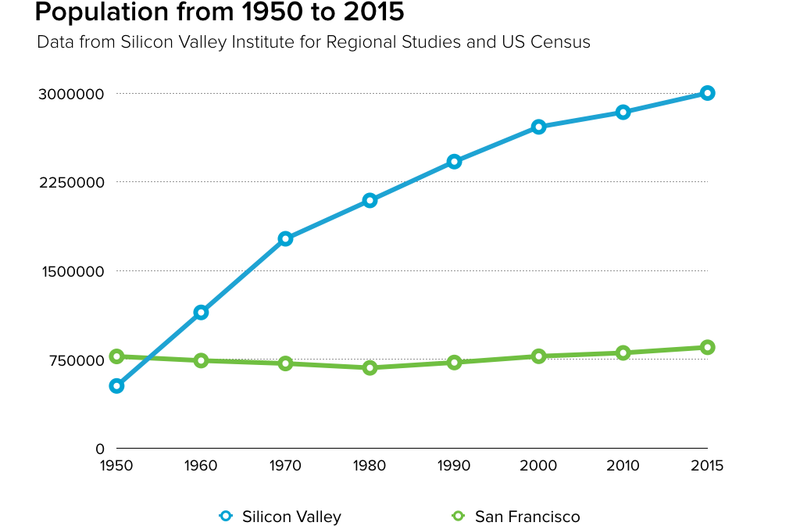 Compared to neighboring San Francisco, Silicon Valley’s population has skyrocketed. Between 1950 and 2015, population grew 10 percent in San Francisco. In Silicon Valley, it grew 470 percent. Rachel Massara, a senior research associate for the Silicon Valley Institute for Regional Studies, said that Silicon Valley has been adding almost 90 people a day. Between 2015 and 2025, San Mateo and Santa Clara counties are expected to add another 217,539 people – a growth rate of 8.2 percent. For some, it’s too much. There are complaints of traffic, long lines and high rents. Some cities, like Palo Alto, are trying to set development limits in certain areas. California’s more than four-year (so far) drought has added another concern: Will there be enough water now and in future decades to support this growth? It turns out, the answer may have more to do with not how much growth, but what kind. In the last year Santa Clara County residents have stepped up and exceeded conservation mandates, cutting water use by 27 percent. Some tore out their lawns, replacing the thirsty turf with drought-tolerant plants, others let the green go brown. For the most part, there was a shared sense of purpose in the face of adversity. But that only extends so far. Jerry De La Piedra, a water quality and conservation manager at Santa Clara Valley Water District, the wholesale water provider for Santa Clara County, has heard rumblings. “We hear people saying, ‘We are in the middle of a drought, there is a water shortage, why is growth still being allowed to happen?’” said De La Piedra. For some it can be hard to reconcile the juxtaposition of brown lawns against a backdrop of new subdivisions. To that end, De La Piedra’s agency has been trying to work more closely with the planning departments of area cities to set the bar higher on building standards that can save water. While there are national and state standards for efficiency and conservation, De La Piedra says they hope to up the ante. California now has among the toughest efficiency standards in the country for plumbing and appliances, which means new houses use way less water than most older homes. That is part of the reason that total water use in urban areas has remained relatively constant in the last 20 years even as cities have increased in population – we continue to get more efficient. Some of these benefits are a ripple effect from the 2009 Water Conservation Act to reduce per capita water use in cities 20 percent by 2020 and last year’s water conservation mandate from Gov. Jerry Brown that sought to cut water use statewide by 25 percent. And on that front, there is still more than can be done. It’s not just about rules from the state or local level – agencies and officials working on land and water issues need better collaboration. A 2013 report from SPUR called “Future-Proof Water” explains that two state laws (SB 610 and SB 221) require that all developments have an assurance from a water agency that there is enough water to meet future demand for the building project. Planners and community officials can also ask utilities to study options and help them understand local water resources, and local potential for reuse, stormwater and gray water capture and treatment, says Tam. “They can also remove barriers for – even incentivize – private sector innovation in these areas,” she said. A sunny March afternoon in Mountain View sounds like a percussion of nail guns and hammers as workers climb the wood skeleton of a new luxury apartment complex near downtown, which spans a block and hovers over the neighborhood’s existing single-story homes. There is no doubt a housing crunch. A research paper from the Silicon Valley Institute of Regional Studies found that in some Silicon Valley cities, housing prices are increasing 20–30 percent year-over-year and 40 percent of residents are spending more than one-third of their income on housing. “These issues will intensify with population growth,” the report states. More development could help ease the strain on the housing market, but at what cost to resources like water? Experts say more growth can be water wise depending on how it’s done. The difference between the “right place” and the “wrong place” boils down to infill, density and proximity to transit. “It doesn’t really require a special type of water-friendly development, it’s just simply building the right kind of development in the right place,” said Madsen whose organization endorsed Station Park Green because it included affordable homes, was near a Caltrain station, had two acres of open public space and promoted car-sharing or biking, which is a bonus for the climate. “With a changing climate, we are in all likelihood in a new reality where water availability is going to be lower than it was in eras past,” said Madsen. Indeed, local water agencies are conscious of the ways in which climate change may complicate long-term water supply scenarios, which is why many are trying to develop more local water sources and increase water recycling to meet future demand even if prolonged droughts or climate change impact water sources. From the 1960s until the market crashed in 2009, the predominant building trend across California was sprawl development, said Madsen. 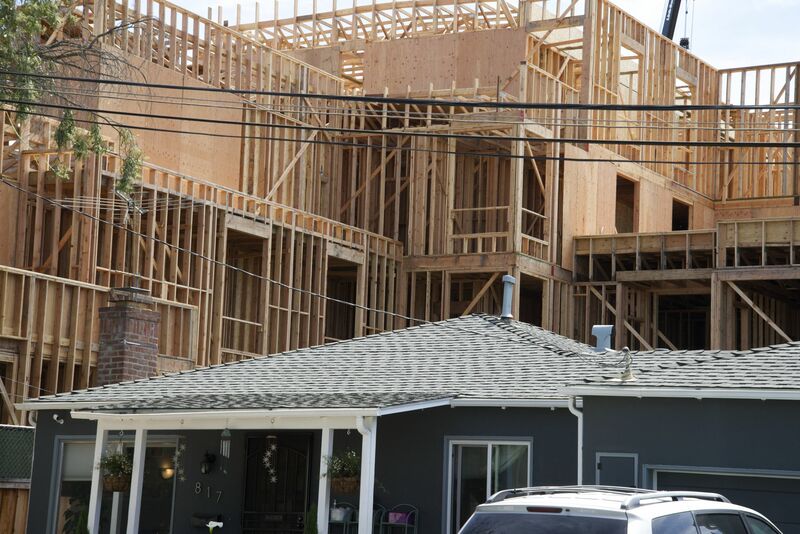 New construction cooled during the recession and now that it’s rebounding in Silicon Valley, Madsen says he sees more infill development and less sprawl cutting up open spaces and farmland. Although sprawl hasn’t been eliminated entirely. “You’re seeing in the hills around San Jose and in southern Santa Clara County that developers coming back now with these types of [sprawl] proposals,” said Madsen. Two recent proposals – one that would have developed 700 acres (285 hectares) in Gilroy and another around 400 acres in Morgan Hill – were both turned back by the Local Agency Formation Commission, which is a countywide agency that oversees boundary changes. “They recognized that both of those ran counter to the agency’s own policies around farmland preservation,” he said. Water Deeply thanks the Silicon Valley Community Foundation for their support in making this reporting series possible.